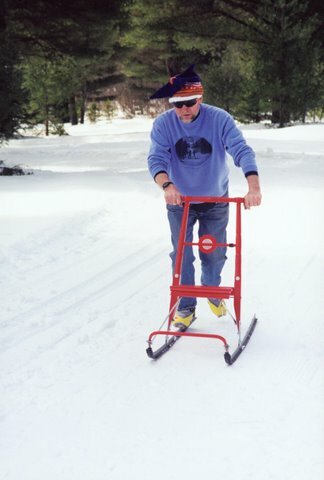 Our Adirondack Ski Resort Provides Fun Activities for the Young & Young at Heart! From ski lessons to games, you and your kids will have tons of fun. And don’t forget to stop at our Kuuma Feeding Station on the 2nd floor of the main lodge building for lunch and/or snacks. Kids' Clubs & Reindeer Rally Fun on Skis! Our popular Lemmings Kids’ Club offers a full hour of instruction with our kid-friendly, PSIA certified instructors. Focus will be on striding, classic technique specifically geared to children from age 5 – 11. For children age 8-14, the fun and fast skate technique will be addressed in the Youth/Junior Skate Club. Lemmings Kids’ Club meets weekends and holidays at 11:15am. Youth/Junior Skate Club meets weekends and holidays at 1pm and each runs concurrently with an adult Beginner Classic lesson so everyone in the family can learn to ski simultaneously! $25 per child. LAPLAND LAKE’S AMAZING REINDEER RALLY FUN ON SKIS! Our amazing Reindeer Rally program offers games on skis! Guaranteed Fun! Geared to kids of all abilities from ages 5 – 11. 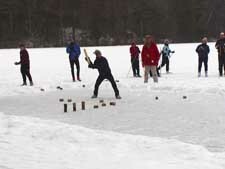 Kids play on-ski games such as the ever popular Lapland Lake Broomball. Your child will have a blast, and without even knowing it, will be learning lifelong ski skills! Parents are encouraged to join in the fun. Or, if you prefer, you may take this opportunity to enjoy adult ski time knowing your child or children are well-supervised and having the time of their lives! Cost for the 1-1/2 hour Reindeer Rally is just $15. Season pass holders may purchase a season-long Reindeer Rally Pass for unlimited program access for just $60! Our Reindeer Rally meets weekends and holidays from 2:15 – 3:45pm. Please note: We need a minimum of three participants for each Reindeer Rally. Ski rental equipment may be exchanged one-time per day for another piece of equipment (snowshoes, tube, ice-skates) at no additional cost (highest rental rate prevails). By taking advantage of this offer, you may enjoy two activities for the price of one! 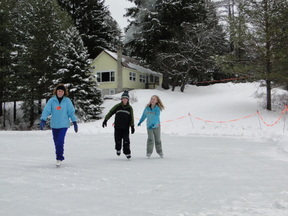 YOUR KIDS CAN SKI, TUBE, SNOWSHOE & ICE-SKATE ALL SEASON LONG! All children in your family ages 17 and under are included when at least one parent or legal guardian purchases a 2017-18 Lapland Lake Family Season Pass Membership! Have an itty-bitty (or two) that wants to join in the xc ski fun? 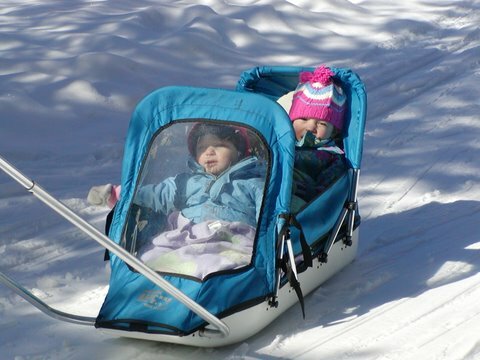 Pulk sleds allow parents to pull children behind as they ski. Equipped with a cushioned waist band and two long aluminum poles, pulk sleds are just the ticket for a successful family outing. Our pulk sleds are available with single or double seats and are enclosed with a weatherproof flexible plastic cover to protect wee ones from wind and snow. Bring along a special blankie. As parents ski, the gentle swaying motion quickly puts most little ones into dreamland! We strongly advise placing advance reservations to ensure availability. Line up for some Finnish fun! Napa Kiikku (translation: “pole swing”) is an incredibly popular ice sled ride for children, unique to Lapland Lake! As ice forms in the early season, we freeze a pole vertically in the center of the pond. An extension pole is attached at an angle, and to the end of this pole a sled is attached. A child lies or sits on the sled while one of Lapland Lake’s energetic employees pushes the pole in circles. The centrifugal force makes kids feel like they’re flying! Check out the picture! Napa Kiikku runs weekends and holidays 3:00 – 4:00pm (ice conditions permitting) and is free of charge with purchase of facility use pass (ages 6+) and to children 5 and under! This should not be missed! Have a blast on a kick-sled! Imagine a wooden seat atop two long, metal runners. Now imagine sitting on the seat with your feet propped on a bar in front of you while your kick-sled partner pushes from behind (one foot on a runner, the other equipped with a crampon “kicking” to propel the sled forward). This is some incredibly fast fun! Kick-sleds are used on Woods Lake when there is exposed ice. Great fun for any kid or any adult who wants to be a kid! Kyykka is a competitive group game played on ice which is great fun for kids and adults! A player’s large bat-like stick is tossed at a row of cylindrical pieces of wood called kyykkas which are arranged in front of a square. Two teams throw their “bats” at their opponents’ kyykkas to try to knock them away from the squares. When one side has successfully knocked the kyykkas out of their opponent’s square, the kyykkas are replaced and the game continues. Addicting fun!